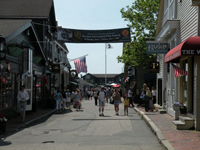 Newport Rhode Island Shopping - The "City by the Sea is a shopper's dream! 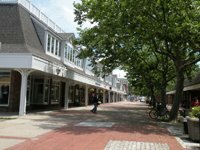 A Shopper's Paradise in the "City by the Sea"
Newport Rhode Island shopping is one of the many reasons the "City by the Sea" is one of the world's best vacation destinations. In addition to its fascinating history, breathtaking scenery and fabulous restaurants, Newport RI is also well known as a shopper's paradise. Check out the list below to learn more about the most popular shopping districts. 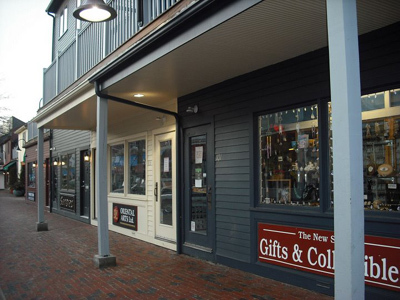 If you're looking for clothing, jewelry, artwork, antiques, unique gifts or just souvenirs to share with family and friends, downtown Newport's historic waterfront shopping district will not disappoint. Check out the map below to see where to begin your Newport Rhode Island shopping adventure. Then browse the sections below for more information on each. Along with the many historic colonial homes here, Thames Street is home to countless shops, restaurants and bars. Beginning at Farewell Street and ending at Morton Avenue, explore unique Newport shops such as Thames Street Glass, Accidental Artist, Muse, Music Box and Aardvark Antiques. 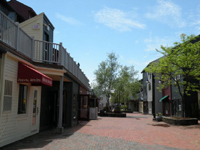 Long Wharf Mall is located between Thames Street and America's Cup Avenue. It is home to a great restaurant, Panera Bread, and includes other stores such as Only in Rhode Island, Joseph A. Bank Clothiers, Yankee Candle and Goodies by the Sea. There are many other unique shops here also. Brick Market Place might be where you want to spend most of your vacation if you love to shop. Situated between Thames Street and America's Cup Avenue, this combination residence/shopping mall is home to shops such as Ireland Calls, Tourist Trap, Pleasant Surprise, The Body Shop and Sole Desire. Established in 1760, Bowen's Wharf is home to over 20 retail shops. 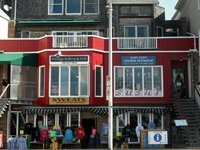 Here you'll find clothing, jewelry, home accessories and unique gifts at locations such as: Michael Hayes, The Schrimshander, Kimberly Pucci, The Sail Loft and Terra Zapato. 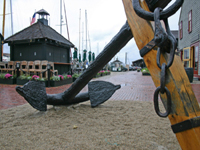 Once the commercial lifeline of colonial Newport, Bannister's Wharf is now home to the Clarke Cooke House and many great shops. Enjoy an ice cream at Ben & Jerry's, then explore The Newport Mansions Store, Mandarine Boutique, Art on the Wharf and Newport Breeze. Newport Rhode Island shopping at its finest. In between Bellevue Avenue and Thames Street, Spring Street is also home to many fine and unique shops. You'll find antique ceramics at the Drawing Room, antique lighting at Renaissance Antiques, assorted jewelry at JH Breakell & Co. and bridal finery at Edna Mae's Millinery & Bridal Studio. Along with the historic sites and Newport Mansions lining Bellevue Avenue, there are many fine shops to explore as well. Visit Michael Hayes, Talbots, Wellspring and The Linen Shop just to name a few. Must see and do: Breakfast at Annie's and Doris Duke's Rough Point mansion. If you've been to Newport before, Broadway probably wasn't on your list of places to visit. What a difference a few years can make! In addition to its many fine restaurants, Broadway is now home to many boutique shops such as: D Kelley Fine Used Books, Newport Hobby House, Anchor Steam Tattoo Gallery, and the Good Shepard Gift Shop. The Newport Mall is on the outskirts of the city, and is one location that isn't really within walking distance. It is home to Wal-Mart, Super Stop & Shop, West Marine, Old Navy and T.J. Maxx. 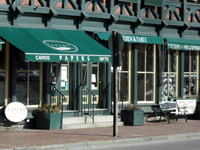 After you've had your fill of Newport Rhode Island shopping, you may be hungry and want to check out some Newport Rhode Island Restaurants.